Home Products Brush Your Teeth With Dirt! Brush Your Teeth With Dirt! Weird dirt used to clean teeth and help them stay healthier now revealed! Did you know you are not stuck with the teeth you have? You CAN strengthen them! Maybe you have sensitive teeth? Or maybe you want to prevent tooth sensitivities? Did you know that a sensitive tooth is the first sign of demineralization- the minerals that keep your teeth strong leech out. If this process continues because the minerals are not replaced- a cavity will result. Made from ancient clays that contain the lost minerals that cause dental cavities. As you brush, the mineral ions in the toothpowder come in contact with the "holes" or demineralized spots on your teeth and the minerals are reabsorbed. The results can be stronger teeth. Dirt: Fill your mouth with vital and trace minerals important to maintain dental health the 100% natural way. Mildly abrasive, gently polishes, detoxifies and refreshes. The abundance of trace minerals in the clays help to re-mineralize and strengthen the teeth. Teeth are living and porous and foods, commercial toothpaste, medications and chemicals (food preservatives) can leech the minerals from the teeth causing weakened enamel that is more susceptible to decay and breakdown. These lost minerals can be found in the variety of earthen clays found in Dirty Mouth™ Toothpowder and absorbed by the teeth. Disclaimer: This WILL NOT taste like commercial, sweetened toothpaste. There are NO sweeteners in this Toothpowder. It may take two or three uses to adapt to the taste. I was equally impressed with the Toothpowder and Gum Serum. I have had gingivitis/teeth/enamel/yellowing problems since I was a kid. The vast majority of my teeth have cavities in them and I was told as a teenager that if I didn’t do something about my teeth soon I'd have dentures by the timeI was 20. Hearing that put me into panic mode, and I began to take extra care of them. I managed to avoid dentures, but until I switched to the tooth powder/gum serum I still struggled with gingivitis, bleeding, yellowing, plaque build up and sore teeth. No more! The last time I was at the dentist my dentist could not believe how good my teeth/gums looked, and even asked me if I went somewhere else to bleach them because they were looking so white. When I said no she asked me a lot of questions about the product I was using – to which I happily told her. My gums no longer bleed, my I have not had a cavity in ages and don’t think I ever will, and they are stronger and whiter than ever." More Testimonial from Kimberly here. I have been eating Paleo over 7 weeks now and have been using Primal Life Organics skin products about 6. I wanted to share that I Love the Stick Up deodorant, face wash and facial moisturizer but I had to share my tooth powder experience: I went to the dentist for my cleaning today and my hygienist RAVED about how healthy my gums were and how great my teeth looked. They did the "pocket test" where they use the little measuring stick to see about receding gums and nearly every one of my numbers went DOWN from my last visit 4 months ago! She was so impressed she had me tell the dentist what I was using! I would love if you could send her a sample. I am so glad I have gone Paleo with both my diet and skincare!! I hope to convert to No Poo over the summer when a daily pony is acceptable! A couple weeks ago, I ordered your clay toothpaste and dirty mouth serum - OMG, I LOVE the dirty mouth serum (the clay toothpaste is pretty great also)! I quit using mouthwash when I went Paleo. The serum has replaced that "need". I will brush my teeth then swish with a drop or two of serum and water in my mouth, then use my waterpik (which nicely distributes the serum around my mouth). Amazing how clean and fresh my mouth feels. Now I need to get an additional bottle to carry in my purse to replace the sketchy gluten-free gum I carry! Please "Like" us on Facebook for updates and new product releases. This is where we will announce when the new flavors are available. Organic Skincare. Natural Skincare. Vegan Skincare. Gluten-free Skincare. *Consult your dentist and continue with regular dental checkups. Results may vary. **FREE SHIPPING on USPS shipping only. All other shipping methods and international shipping will receive $5.95 off shipping rate. Deidra S. Reviewed by Deidra S.
Tastes great. Teeth feel super clean! Ronda N. Reviewed by Ronda N.
TONI L. Reviewed by TONI L.
Love how clean my teeth feel! Cathy B. 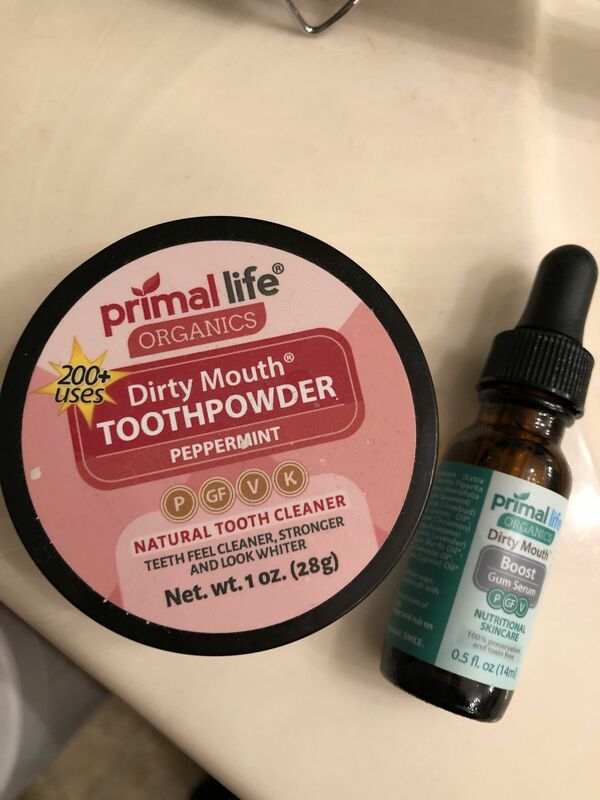 Reviewed by Cathy B.
I love how my teeth feel after brushing with Primal Life tooth powder!! I didn’t know I had space between my teeth like I feel now. Brenda J. Reviewed by Brenda J.
Cleans my teeth very well and tastes great! !